It would be harder to find too many players who have helped themselves more in the eyes of the NFL scouts since the college season ended that former UConn linebacker Sio Moore. Moore used impressive showings at both practice and on game day at the East-West Shrine Game and Senior Bowl. Add in what he accomplished in the last couple of days in Indianapolis at the NFL combine, and it is clear that Moore's star is clearly on the rise. It started yesterday when he was second among the linebackers with 29 reps at 225 pounds in the bench press. Today he finished in the top five in three different categories among the linebackers. 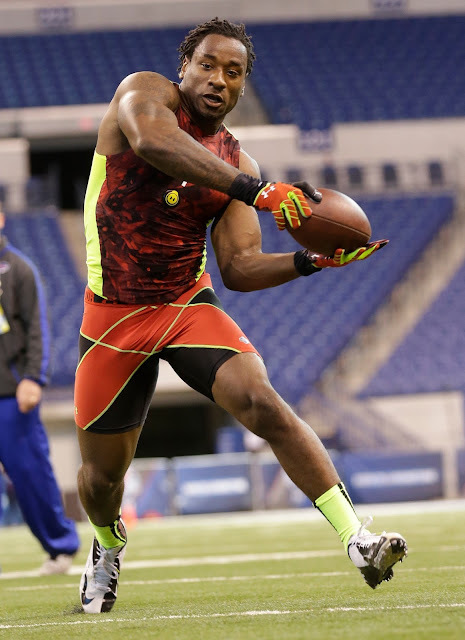 Moore was third with a 38 inch vertical leap, fourth with a broad jump of 10-7 and fifth with a 40-yard time of 4.65. Moore's performance compares favorably with what Lavonte David did in 2012. Both are 6-1 although Moore weighed 12 pounds more, his arms where more than two inches longer and he had bigger hands as well. They ran the same time in the 40 while Moore had the slight edge in the vertical jump (38-0 to 36-8) and broad jump (10-7 to 9-11) with Sio easily outdistancing David in the bench press (29 to 19). David had the edge in the 3-cone drill and 20-yard shuttle. David went 58th overall and had 139 tackles as a rookie with the Tampa Bay Buccaneers. Tomorrow it is time for former UConn cornerbacks Dwayne Gratz and Blidi Wreh-Wilson to run for the scouts. Gratz was tops about cornerbacks in the bench press as he did 225 points a total of 22 times while Wreh-Wilson did 14 reps on the bench press.